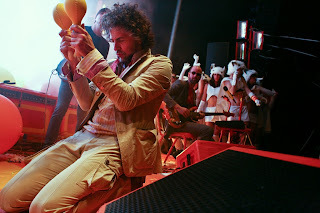 The final day at Chicago's Pitchfork music fest this year appeared to be all about the carnivalesque magic of The Flaming Lips. While I (somewhat controversially) think their best music is far behind them, their live show continues to be among the best in the biz. 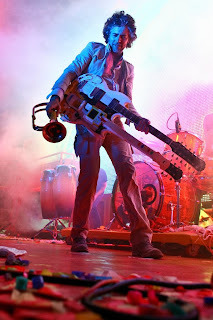 Thanks again for my friend Francis Chung offering up his professional rock photogs to my blog. His work, including these pictures, are regularly featured at Pitchfork's authoritative indie-rock Web site. Also see my posts about his work at the festival on Day 1 and Day 2. Where will the soon-to-be-released Embryonic fall in the list? And how would you rank the Lips's albums? I saw them with Robyn Hitchcock and Sebadoh at some little place (The Pageant?) in St. Louis way back when. And that Lollapalooza tour.